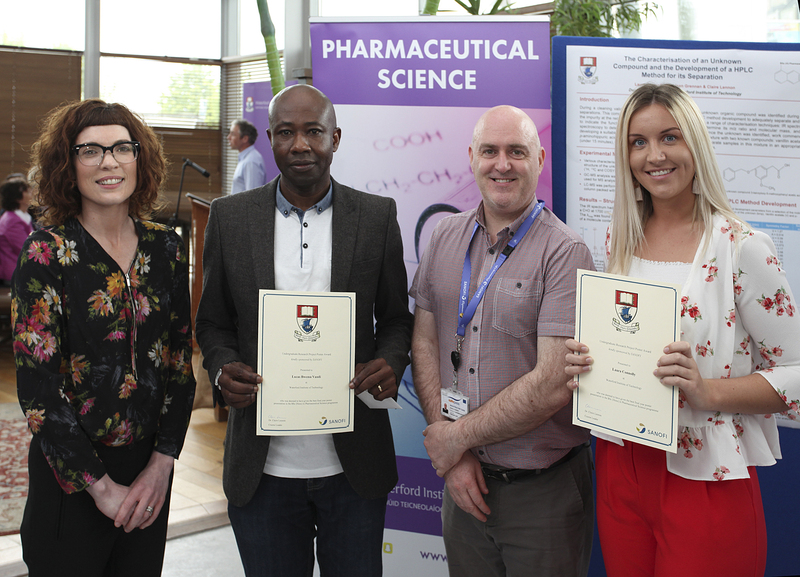 Students of the BSc (Hons) in Pharmaceutical Science course Laura Connolly and Lucas Bwema Vandi were the winners of the Final Year Research Project Poster Award which was sponsored by Sanofi. Pictured second from left is Lucas. Lucas Bwema Vandi was one of the winners of the Final Year Research Project Poster Award 2018 which was sponsored by Sanofi. At the Science Undergraduate Research Experience (Sure) conference for the South Eastern region, the judging panel award of “Best Poster”, sponsored by MSD went to Lucas. Lucas studied thiocarbonyl compounds and how they can by synthesised for pharmacological purposes. Lucas’s project was supervised by Dr Joe Power. I have always loved chemistry when in secondary school and also have a passion with relation to saving lives. Can you recall your feeling when finding out you were offered a place in WIT? When I was offered a place at WIT to accept the place I had a divided mind because of financial issues. I accepted the place but put it on deferral for one year before starting. It was highly enjoyable especially when it comes to practical work. This is because you tend to see things happening and not visualizing. My advice will be apply to study in WIT, because it is made up of amazing, gifted and outstanding lecturers, who work tirelessly to inspire the students. How was work experience of benefit? During my 6 months’ work placement at Medentech Wexford, I worked in the Stability/Validation Department as a Stability Technician & Quality Control (QC) Department as a Quality Control Analyst and in the Research and Development (R&D) Department as Laboratory Analyst. I was involved in three different projects with the R&D during my placement with the company. It was a wonderful experience, valuable lessons and better preparation for the future and great opportunity to develop my communication skills through dealing with colleagues at work. What did you do before studying at WIT? Voluntary Basic Computer & English teacher, 2012/2013, Integration Support Unit (ISU) Waterford, Ireland. Voluntary worker (emergency accident), 2006/2016, Irish Red Cross Limerick, Ireland. Voluntary worker, 2008, National Council for the Blind in Ireland, Limerick, Ireland. Had you any feelings of doubt about attending college? I had doubts, due to financial constraints, but my humble wife did motivate me and advised me not to give up. What advice would you have for students about getting through college? Try to work in the same pace with your lecturer. Avoid missing lectures and not doing assignments. Life in Waterford has been amazing. All amenities and facilities are available for instance, transport, shops etc.